Power Surge Live with Charles Foster, Ph.D.
on a John Stossel 20/20 Prime Time Special for ABC News. better. 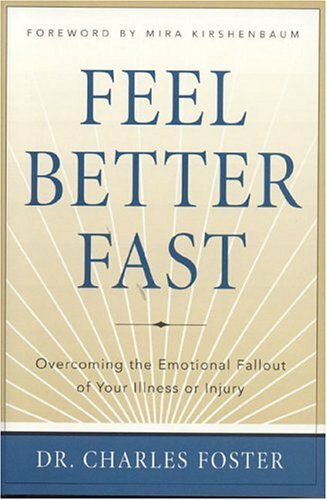 Feel Better Fast is the first and only book to show how to do this. Did you know that emotional and psychological distress accounts for sixty percent or more of the total distress you feel when you're sick or injured? It's true. This means that if you relieve the emotional fallout of your illness or injury, you have begun to address the most important factor standing in the way of your feeling better. Feel Better Fast is the first and only book to show how to do this. If even one of these applies to you, then you have the potential to feel better faster and achieve a more complete recovery than you may have thought possible. Feel Better Fast makes possible the ultimate in holistic medicine. We've had important advances in treating the body as a whole. With this book we've reached the final stage: the ability to treat you the person as a whole. By finding solutions for the emotional fallout of your illness or injury, you as a whole person, not just your body, have everything you need to achieve the fullest, fastest recovery you're capable of. Read The Transcript WithDavid Johnson, Ph.D.